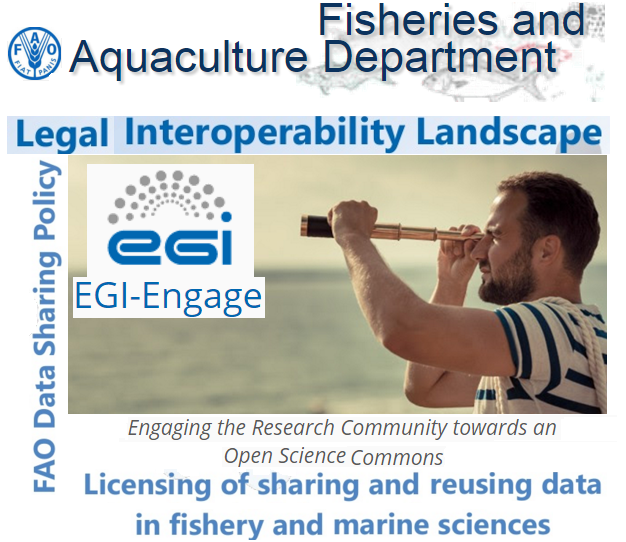 In the frame of the EGI-Engage Project, the Fisheries and Aquaculture Department of the FAO has been working on analysis of data sources of stakeholders in the fishery and marine sciences in terms of legal interoperability. The ongoing work on this project was presented on 17 of March 2016 at the FAO Headquarters in Rome. The EGI-Engage project (Engaging the Research Community towards an Open Science Commons) started in March 2015, co-funded by the European Commission for 30 months, as a collaborative effort involving more than 70 institutions in over 30 countries. EGI-Engage aims to accelerate the implementation of the Open Science Commons by expanding the capabilities of a European backbone of federated services for compute, storage, data, communication, knowledge and expertise, complementing community-specific capabilities. Objective 1: Ensure the continued coordination of the EGI Community in strategy and policy development, engagement, technical user support and operations of the federated infrastructure in Europe and worldwide. Objective 2: Evolve the EGI Solutions, related business models and access policies for different target groups aiming at an increased sustainability of these outside of project funding. The solutions will be offered to large and medium size RIs, small research communities, the long-tail of science, education, industry and SMEs. Objective 4: Prototype an Open Data platform and contribute to the implementation of the European Big Data Value (be part of the EU map of Big Data in agriculture and food sector! : just add your institution (or team) and your Big Data related sources and activities). 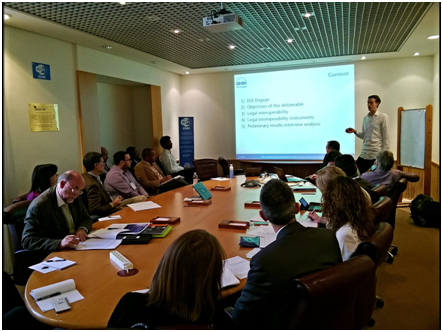 FAO is one of the 17 partners of the project and is engaged in activities focused on the identification of data sharing policies and legal aspects for fishery and marine scientific. 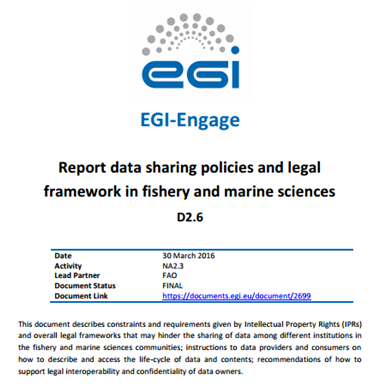 TASK NA 2.3.3.1: Data Sharing Policies and Legal Aspects (fishery and marine sciences datasets). Advice on how the legal interoperability is best supported through infrastructure security, especially where storage and access arrangements are required (e.g. to support confidentiality needs of data owners). To present the ongoing work on the project to various departments of FAO (e.g. legal, communications, geospatial etc. ), the Fisheries and Aquaculture Department of the FAO organized recently (17 March 2016) a meeting at the FAO Headquarters in Rome. The meeting was chaired by Marc Taconet (Chief of FAO’s Fishery Statistics and Information Branch, FIPS), Anton Ellenbroek from the FAO Fisheries and Aquaculture Department and Eise Van Maanen from the UN FAO team. Between participants of the meeting there were also Johannes Keizer and Stephen Katz - persons with long experience in information and knowledge management in the agrifood sector. The presented results were related to an analysis of data sources of stakeholders in the fishery and marine sciences along with licensing schemes available, in terms of legal interoperability. main points for recommendations that will facilitate data exchange between data sources, thus enhancing data (re)use and sharing and allowing the development of data-powered services on top of them. The topics discussed during the meeting received valuable feedback from all participants. The next steps/opportunities for taking collaborative working among project partners to new levels were outlined. A number of FAO staff members like Johannes Keizer, Thembani Malapela and Fabrizio Celli from FAO AGRIS and AIMS were interviewed. The results of the investigation of data about sharing policies and legal framework in fishery and marine sciences can be viewed in the “Report data sharing policies and legal framework in fishery and marine sciences” published by FAO on 30 March 2016. EGI ENGAGE Fishery & Marine Legal Interoperability (slides) .